It seems that there is often confusion about descriptors – what they are and how to use them in your mixed methods or qualitative data analysis. Descriptors are powerful. They allow you to break out your qualitative work across demographic and other survey data for greater insights. When using descriptors in your qualitative data analysis, in addition to being able to analyze media files, you are able to break out the information that describes the source of your media files to see things from different perspectives and introduce new dimensions to your analysis. And since Dedoose allows for multiple sets of descriptors, you can add as many levels of analysis as your study needs. Since descriptors are simply too powerful for you to ignore, or worse, use incorrectly, we are going to take this slow and steady. And we will count on your feedback and questions along the way. Most of the questions about descriptors we receive in the forum, on Facebook, Twitter, and via email are rooted in a lack of understanding of key terms and where to find them in Dedoose. So that is where we will start. Our descriptor series will have multiple parts beginning with Part 1: The Lingo. Here we will give a brief overview of descriptors as well as a glossary, and image map showing where to find each key term in Dedoose. Next week we will be looking at how to create, delete, and edit descriptors manually. If you have any tips, tricks, or questions on this topic send them our way and we will do our best to address them in the coming weeks! The brief overview: descriptors and your qualitative data analysis. So, what are these descriptors anyway…? And what does it mean for my qualitative data analysis? In Dedoose, descriptors are sets of information you use to identify and describe the sources of your resources/media (e.g., documents, video, audio, images). Generally, descriptors are the characteristics of the participants in your research (e.g., individuals, dyads, families), but can also be descriptions of settings in which observations are made (e.g., stores, schools, neighborhoods, cultures). The descriptor fields and variables that comprise each descriptor set may include demographic information, dates, scores from survey measures, test results, and any other information you gather that is useful in describing and distinguishing the source of your media—essentially your level(s) of analysis. Once you upload or manually add in your descriptor information, you ‘link’ each source with the corresponding media. So, let’s look at an example that might be used in a qualitative data analysis. Let’s say that you are doing a study that involves parents and children in which you have interviewed 10 children about reading at home. And, based on your research questions and goals you decide you want to look at three levels of analysis. You have information on each child (name, gender, ethnicity), the school they attend (e.g. location, faculty size, curriculum etc), and the district to which each school belongs (average family annual income, square miles of capture area, percent rural versus urban neighborhoods). Let’s look at the ‘Children’ set for now. For this descriptor set you might know the ID, name, gender, ethnicity, and home language of your participants. These will become the descriptor fields (or variables). Think of these fields as questions. What is your ID? What is your name? What is your Gender? For each field you will list each participant answer — for example, ID#123, Dee Doose, female, Hispanic, and so on. These answers are called data points (or just data) and the specific response is a ‘value’—ex. 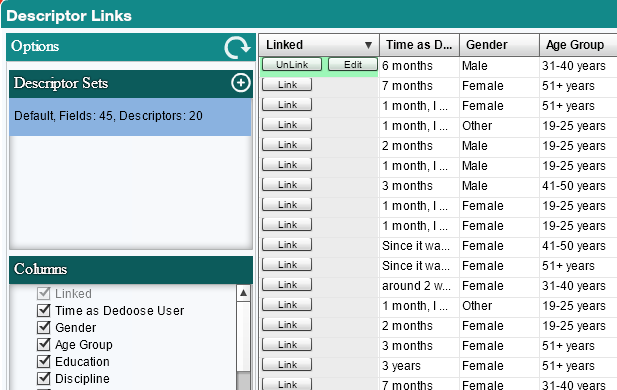 the gender variable has two possible values, male or female (a categorical or option list field); while ID can be any number that uniquely identifies a research participant..
For each descriptor set the fields will change as will the possible values in the data. It is important to make sure you are in the proper descriptor set before adding, editing, or deleting fields or descriptors. In Part 2 and 3 of our blog series on descriptors we will outline the step by step process of creating/adding/editing fields for each set and variables for each descriptor. But, how does this help my qualitative data analysis? And, when using descriptors you can break your data down by field, by code, and more in the Analysis Workspace. When you use descriptors in Dedoose, your charts, graphs and plots, like the ones below, allow for greater control over your data and bring it to life with more complex and comprehensive perspective that can never be achieved with qualitative or quantitative data alone. Also, these charts and graphs are in presentation ready format, so once you analyze your integrated qualitative and descriptor data, export the result and you can pop the images that tell your story best right into Word, PowerPoint, or Excel. 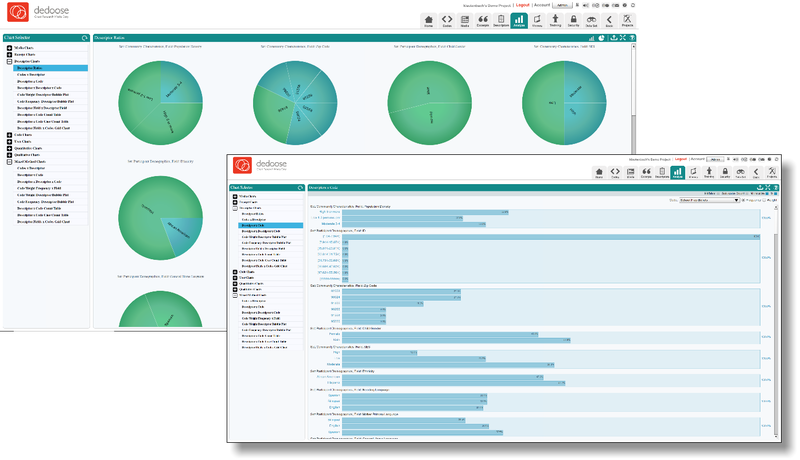 Workspace: The home screen for a particular feature such as descriptors, media, analysis etc. The workspace icons are on the top right corner of your screen regardless of which workspace you are currently using. The workspace you are in will appear shaded. Selecting the descriptor icon will take you to the descriptor workspace. 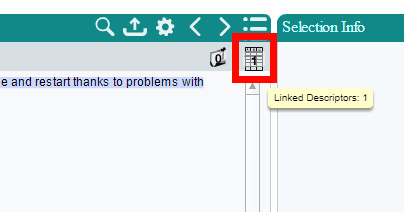 In the Descriptor Workspace there are three collapsible panels—the expanded ‘Set Fields’ panel, the expanded ‘Columns & Filters’ panel, and the collapsed ‘Charts’ panel (clicking on the arrows in any green panel header will serve to expand or collapse each panel). Descriptor (SINGULAR): The data used to uniquely identify and describe the sources of your media (e.g., documents, video, audio, images). Commonly, these are the characteristics of your research participants (e.g., individuals, dyads, families), but can also be descriptions of settings in which observations are made (e.g., stores, schools, neighborhoods, cultures). When looking at the image above, you will see that a descriptor is the entire row of data. A Descriptor can also be called a Case by some disciplines. The terms Case and Descriptor can be used interchangeably with terms like “individuals” for example if your descriptors have to do with the individual participants in your study. Descriptors/Cases (PLURAL): When used in the plural form, these words may refer to your total number of descriptors. Descriptor Sets: These are containers in Dedoose that hold sets of descriptor fields and descriptors. Dedoose uses sets because you can have multiple sets in a study. Examples of descriptor sets include research participants, families, schools, other settings. Sets are most helpful when you have multiple levels of analysis – for example, your sets may include a school district, schools within each district, and students (or children) within each school. Think of descriptor sets as folders, and descriptors as your files. Each set is a group that can be characterized. In the image above, the descriptor sets are: Children, School Districts, Schools etc. The image shows that the descriptor set labeled ‘Children’ is highlighted and therefore the descriptors shown in the image above are those that correlate to the ‘Children’ set. It is as though the folder marked ‘Children’ is open and we are able to view the “files” of descriptors. A full list of the sets you have created are listed in the ‘Descriptor Sets’ panel at the top left of the Descriptor Workspace. Descriptor Field: Think of fields as the questions you ask. What is your name? For example, “gender, ID, ethnicity” are all the descriptor fields. Also commonly referred to as ‘variables’ as individual cases ‘vary’ on their answer to the questions. The descriptor fields that comprise each descriptor set may include demographic information, dates, scores from survey measures, test results, and any other information you gather that is useful in describing the source of your resources—essentially your level(s) of analysis. Note: You can only enter data for dynamic descriptors when linking to a particular document. When you link to this document, a pop up will reveal the phase options you have to choose from. We will visit this topic again later in this series exclusively on dynamic descriptors. 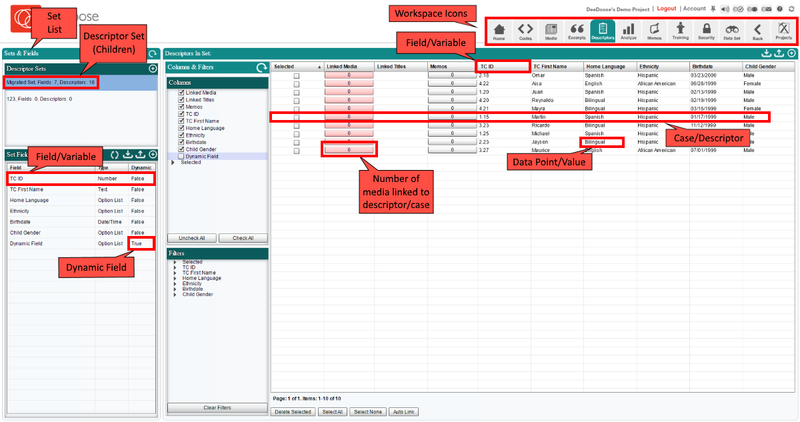 Data Point or Value: The data within each field for each descriptor. Using the question and answer analogy, the question might be, “What is your gender” for the gender field. The answer of “female” would be the data point or value. As fields can be of different types, i.e. number, text, data, option list, the values can be unique to each case (as with an ID number) or one of a set of valid values (as with ‘Income Level’ where the three choices might be ‘high,’ ‘moderate,’ and ‘low’). Linked Media: This column shows how many times the given descriptor has been linked to a media file (e.g. to a document, video file, or audio file). Each document can only be linked to one descriptor per descriptor set unless a dynamic field is present for the purpose of showing change over time. In the image above, we have one dynamic descriptor field – for the phases of the project so we have two descriptors that have been linked to more than one media file. ‘Descriptors In Set:’ In this panel you will find all the descriptors you have added for the set you have chosen. The buttons in the ‘Descriptors in Set’ panel header for importing, exporting, or adding descriptor data respectively for the set you have chosen. ‘Descriptor Sets:’ You can add descriptor sets using the icon. (Descriptors themselves are added in the ‘Descriptors In Set’ section of the workspace) using the icon in the top right corner of the ‘Descriptor Sets’ section of the Descriptor Workspace. In our riveting new series, Descriptors Part 2: The manual guide to adding/deleting/editing descriptors, we will explore the basics of creating descriptors within Dedoose. We will also be covering, importing and editing descriptors using Excel, dynamic descriptors, survey importers vs. descriptors, and how to optimize your use of data visualizations in the coming weeks… so stay tuned. Once again, if you have any tips, tricks, or questions about descriptors send them to [email protected] and we may include them in an upcoming blog post. And as always, keep up with us on Facebook, Twitter, and LinkedIn!